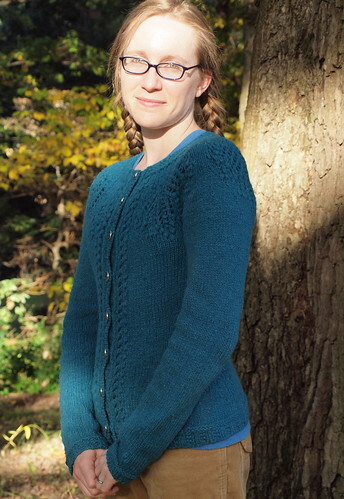 A yoked cardigan, featuring maple leaves in nupps and lace. 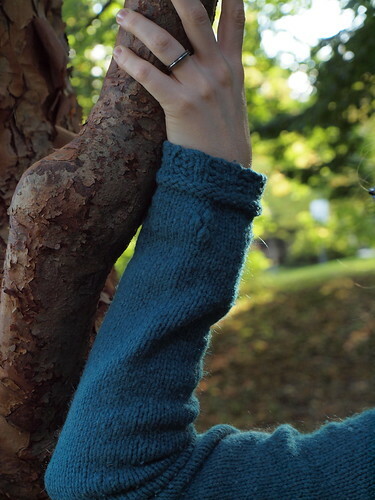 Inspired by Nancy Bush’s “Knitted Lace of Estonia”, which features the gorgeous, delicate lace designs from Haapsalu, I sought to create a sweater that would feature nupps and lace, writ large. 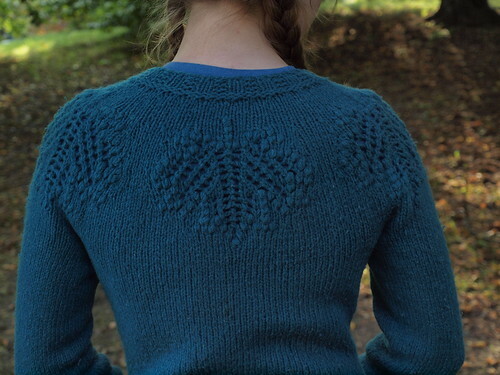 The end result was a cardigan whose yoke is adorned with large lace maple leaves, outlined by nupps. Skills required: Ability to read a charted stitch pattern. Increases and Decreases, Yarnovers, Nupps (directions are given in pattern), Tubular Cast-On (directions are given in pattern), Kitchener Stitch (directions are given in pattern). Sizing Notes: Sizing is partially customizable. Designed to be worn with minimal positive ease. 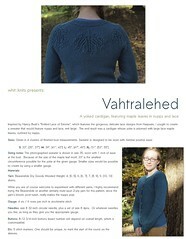 The photographed sweater is shown in size 35, worn with 1 inch of ease at the bust. Because of the size of the maple leaf motif, 33” is the smallest circumference possible for the yoke at the given gauge. Smaller sizes would be possible to create by using a smaller gauge. Yarn: Beaverslide Dry Goods Worsted Weight: 4, [5, 5]; 6, [6, 7]; 7, [8, 9]; 9, [10, 10] skeins. (These are generous estimates; you may be able to complete your sweater with less yarn than indicated, but I prefer to err on the side of having extra yarn). While you are of course welcome to experiment with different yarns, I highly recommend trying the Beaverslide or another similarly mule-spun 2-ply yarn for this pattern, since the yarn’s bloom, post-wash, really makes the nupps pop. Needles: size 8 32-inch circular needle, plus a set of size 8 dpns. Or whatever needles you like, as long as they give you the appropriate gauge. Buttons: 8-12 3/4-inch buttons (exact number will depend on overall length, which is customizable). Etc: 5 stitch markers. One should be unique, to mark the start of the round on the sleeves.